A couple of weeks ago, my relationship with chai tea was transformed. I love chai tea, and I've had great chai tea in Indian restaurants. But drinking chai tea at home has always been a huge disappointment. Now I know why. Homemade chai tea made with fresh whole spices makes those chai teabags you buy in the store taste like wet cardboard. A couple weeks ago, we toured Melody's kitchen in the Real Food Kitchen Tour. She posted her recipe for homemade chai tea in the comments. It sounded so good to me, that I decided to give it a shot. I'm so glad I did. I especially like the chai tea with coconut milk. I've been reading Coconut Cures: Preventing and Treating Common Health Problems with Coconut. In the book, Dr. Fife says that we should aim to get 3-4 tablespoons of coconut oil per day. I am one of these people who really does not like taking coconut oil off the spoon. But guess what? Three ounces of coconut milk contains a little over 1 tablespoon of coconut oil. I have not found a better way to take my dose of coconut oil than this chai tea. This recipe may sound like a lot of work but I have really been enjoying making it. I even made a few extra bags of chai tea to give to my friends and family members as gifts. Caffeine is really bad for you! I'm still recovering from adrenal fatigue and it has taken years. And don't kid yourself — all forms of caffeine are bad for your adrenals. This includes black tea, which is caffeinated (not to mention green tea). To read more about why I quit coffee and why it's bad for you, read this: How to Quit Coffee. 1. Smash the cardamom pods with the back of a knive or using a mortar and pestle. 2. Grind the pepper and grate the nutmeg. 3. Chop up the crystallized ginger. 4. Add all the spice ingredients — everything except the tea, filtered water, milk and honey — to a paper tea bag. 5. 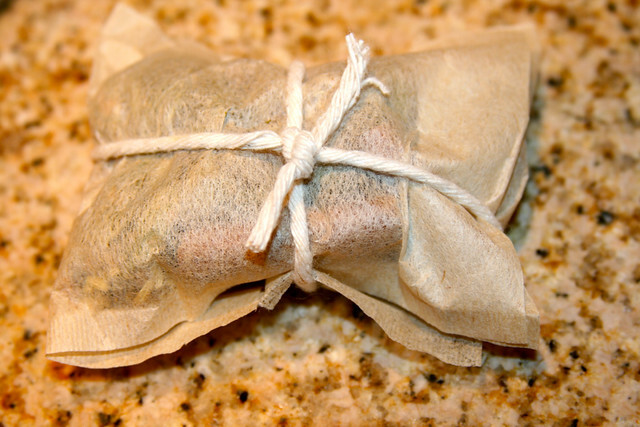 Cut a 10- to 12-inch piece of kitchen twine and use it to tie the homemade tea bag closed. 6. Fill a saucepan with 4 cups of filtered water and bring to a boil. 7. Add the homemade tea bag and the 4 decaf black tea (or roobios) bags to the saucepan. 8. Turn off the heat and let steep for 5 minutes. 9. Remove the black tea/roobios tea bags (if you leave them it will become very bitter). 10. Leave the homemade tea bag in the water and let steep for 24-36 hours — or simmer on low for 20-30 minutes. 11. When it's done steeping, just remove the tea bag and store in the fridge. 12. When you're ready to make a cup of tea, pour half a cup's worth of the chai tea blend into a small saucepan. Turn the heat on medium-high and let it get nice and hot. 13. Add honey to taste; stir until blended. 14. Add the raw milk or coconut milk and stir until blended. 15. Pour into a cup or mug and enjoy. Note: The chai tea base will keep in the fridge for about a week. I guarantee it won't stay in there that long, though! Depends…I sometimes just put the spices in a small spice bag (enough for one serving) and make a cup of chai straight from that. I’ll hang up the bag and re-use again for moments of desperation where I haven’t had the forethought to make a batch (I drink it so much, I have been known to drink entire batches before the day is over). I prefer the longer steep, since it keeps the temperature lower over a longer period of time (I’d like to think you get more health benefits out of it? )…play around with it? When I posted the recipe a few weeks ago, Ann Marie so graciously asked me questions that I just couldn’t solidly answer (like how many cups of water, haha), yet she still managed to describe EXACTLY how I make my chai, I just didn’t include all those steps when I wrote it the first time! It’s a fairly flexible recipe though. You might like more ginger (I do when I’m fighting some kind of cold) or more cardamom (very tasty in the summertime, iced), or more clove if you’re pairing it with a squash or pumpkin dish….mmm…. I read this in the comments a few weeks back and it sounded delicious. I will pick up ingredients at my health food store today. Thank you! Btw I bet this would make amazing kombucha! I’ve used chai tea bags before with green tea and it’s turned out well, I can only imagine how good this will be. I use chai to make mine and I use Trader Joes candied ginger for the sugar part.. tastes super good! yum! this is exactly the post i was hoping for :) thanks so much! Okay, confession…I’ve always just used the teabags (either Celestial Seasonings or Tazo) but have wanted to try making it homemade for a while now. I did pull the recipe off the discussion you referenced, but THANK YOU for putting together an actual post on this, as this is a lot more clear and concise :-). I guess I’m buying spices tonight! I’m so excited to make some chai. Mmmmmmm, thank you SO much for this recipe! I heart chai tea. And I love recipes I can leave and come back to in a day or two. Part of why I love traditional food prep so much. Thank you! I was going to post the same thing! Spiced chai would be more true to the recipe perhaps? Finding organic decaf black tea is no easy feat. I know you said you get yours at Whole Foods but the nearest one to us is about 2500 miles… lol. My local health food store has none, the local grocery… none; tea and spice company… nope. I just ordered some from amazon, $17 for 4 ounces (yikes!) so if anyone comes up with a better source PLEASE post. I normally like to patronize local businesses but do order online from a small herb business called Bulk Herb Store. Excellent service, fresh, high quality herbs and good prices. They do carry rooibos, dried ginger root (which I would recommend over the candied variety), ginger powder, cayenne and fennel, plus many more if you are looking for medicinal and culinary herbs. You can naturally decaffeinate black tea (or any other caffeinated tea) yourself. Here’s how: Take the black tea (loose leaf, in a bag, whatever) and pour boiling water over it. You need to let it over-steep by about 3 minutes. For example, black tea has the longest steep time- about 3-5 minutes (depending on the directions of the package). Green tea is about 2-3 minutes, white tea is about 1-2 minutes. The tea will become bitter, which is much of the caffeine (and other stuff) coming out. Dump that first batch, and voila, you’ve got yourself decaf tea. It still has anywhere from 5-20% of the caffeine left, BUT you can just repeat the process. Fine tea drinkers do say that black tea is best on the 3rd or 4th steep time (probably because the caffeine has been sucked out of it and it has a more delicate earthy flavor). I get my black tea from an international shop nearby that specializes in Indian food, so if you’re lucky to have an international store (even a hole in the wall store should carry some), try there. Charity (if you read this), feel free to add to this. Charity owns her own tea shop up in Oregon and is in the process of growing her own teas (way to go girl! ), her shop is called “Chariteas.” You might google her store (or look her up on Facebook) and see if she’ll sell you some! I know it’s organic, and she visits each of the tea plantations herself on a regular basis, and is looking at starting one locally in Oregon as well. Wow, thanks Melody. I had thought about that method but since I had never actually TRIED it before I assumed there would be a loss of flavor, and I really love a robust tea. As I said above, I did buy some already decaffeinated (co2) so I’m going to do a taste trial comparison between that and using your method and see. Doing my own decaffeination process will make it much more affordable. Where did you find crystallized ginger? I checked Wilderness Family Naturals and they do not have it. You can find crystalized ginger in most stores, especially around the holidays. I know I’ve bought it from the bulk bins at a Whole Foods. It’s not critical though, you could put in a few slices of fresh ginger instead and just add a touch of honey if you want the sweetness of the sugar on the crystalized ginger. I had to start making mine in a double batch because there’s no way it lasts a week! It’s so yummy! love chai! So great to see you this weekend, thank you for letting me be a part of Real Food Media. I am ready to roll with a word press switch from blogger and use the wonderful resources you have created! A raw milk toast to YOU! Do you realize that decaf tea still has caffeine? Yes, I prefer roobios for that reason. Have you tried mixing both tea and rooibos in your chai? I’m going to try that! I have been drinking “half caf” for years but (thanks to your encouragement) am completely off caffeine except for what remains in decaf tea and coffee… and since I only drink decaf coffee a couple times a week these days and have been unable to locate decaf tea (my order just arrived on Tuesday, yeah!) I really have been doing well at keeping it out of my system. Oh thank you, thank you, thank you, thank you AnnMarie! I have been searching for a homemade chai recipe for months, maybe years, and I have not found one that sounds as good as this. I’m heading to the store to get my spices TODAY! :) So excited! Awesome! I have always wanted to make my own; can’t get enough of those spice combinations! Howdy! I so enjoyed meeting you at the Wise Traditions conference. I do hope you continue to love camel milk. Hi, Kim! It was nice to meet you, too! Did it… made it with a half and half combination of black and rooibos. I was wondering if it would be spicy enough for me… it is. The slight burn of the cayenne at the back of my throat when swallowing is something I find very soothing. I’ll have to double the recipe though because I drink out of a sixteen ounce beautiful pottery mug (it’s part of the pleasure) so really only two servings for me. I only used a couple tablespoons of coconut milk so most of the volume has to come from the tea base. Thanks again Ann Marie… looking forward to energy medicine! I am glad you enjoyed it! I love it! Yay, thank you! I can’t wait to try this. :) I loooove chai. How can I make crystallized ginger or a good substitute? I am on GAPS so can do no sugar. Awesome! I’ve been on a huge chai tea (blended up with coconut cream and stevia) kick lately, as I was craving those Starbux chai tea lattes I used to love. You are right about the tea bags, the flavour is really lacking – so much so that I’ve been dumping ginger and cinnamon powder in as well, in an attempt to jack up the flavor! Thanks so much for this recipe. I am really enjoying it. I am going to have to mass produce it; I drink the whole batch in one day! Love this recipe, thank you! So much better than any chai I’ve had in Starbucks, Costa or Cafe Nero (UK). I don’t like too much heat so I leave out the cayenne and the ground pepper and it’s perfect for me. My friends agree. Well done and thanks again. How many times can you reuse the chai bag? Cardamom… 25 pods or seeds? 25 pods sounds strong for 6 cup serving? Awesome recipe…. Still making to this day. I just wanted to update this tea recipe by adding that you can substitute red raspberry leaf tea for the rooibos. It has a very similar flavor profile to black tea but it is naturally caffeine free and creates a more robust chai.